Every October, hunters descend on our town. Some are novices and some are professionals, but everyone comes prepared with boots and a knife. Fortunately for everyone, this group is only hunting for mushrooms. 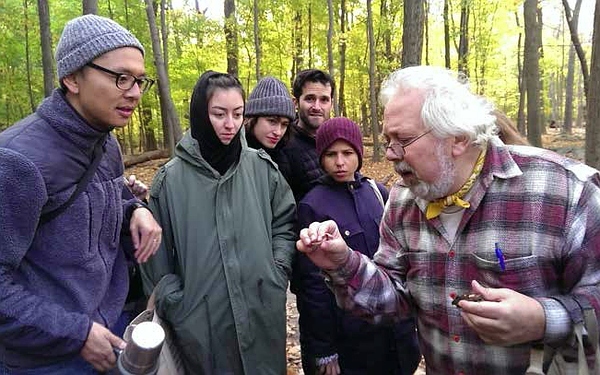 Organized by the New York Mycological Society (NYMS), experts in the field of mycology lead a mushroom foray into Tallman Park to study, document, and catalogue the species found in our extremely fungi-fertile area. The New York Mycological Society is a not-for-profit organization dedicated to raising the public awareness of mushrooms in science and cuisine with over 150 members who participate in lectures, weekly walks, identification sessions and workshops in and around the city. The NYMS was reincarnated from its early beginnings into its modern form over 50 years ago by a small group of mushroom lovers, including American avant-garde composer John Cage. Mushroom foraging is often seen as a bizarre or dangerous hobby; however, most people’s fears are extinguished after returning from their first successful foray with a basket of freshly cut morels. Like any avid forager, I would never divulge my secret spots where large quantities Cantharellus cibarius (chanterelles) pop up a few days after a heavy July rainstorm but our old growth trees, moist soil, and unique microclimates make many areas in Palisades a haven for some of the most sought-after edible species. Grifola frondosa, Pleurotus ostreatus (oyster), Boletus aereus (closely related to the porcini or cep), Ganoderma lucidum (reishi), and Calvatia gigantean (giant puffballs) are all common sites in the area during the summer and autumn months. Foraging for edible mushrooms without experience is not a good idea. Gary Lincoff, author of mushroom guides including the National Audubon Society Field Guide to North American Mushrooms, quotes a Croatian proverb: “All mushrooms are edible, but some only once!” Although the bulk of mushrooms in our area is inert, neither poisonous nor edible, there is a handful of poisonous species. Some, however, such as the giant puffball which grows up to 18” in diameter are unmistakable for even the most novice forager. Cut into slices, dipped into egg, breaded, and then sautéed, the giant puffball is one of my favorite edibles with a texture somewhere between fresh mozzarella and tender chicken. Grifola frondosa, or hen-of-thewoods, is another familiar site in Palisades every fall. This delicious, abundant mushroom often grows at the base of old growth oak trees, appearing year after year. Known in eastern medicine as maitake, henof- the-woods is only starting to be embraced by western medicine; it’s being studied at Memorial Sloan– Kettering Cancer Center where it is proving to be a powerful immune system stimulant. I should add it goes great with fresh pasta in a light cream sauce. One of the easiest ways to know the mushroom you are eating is safe is to cultivate it yourself. A few companies sell small wooden plugs that are inoculated with wild mushroom spores. Mushrooms are efficient decomposers and when logs and stumps are inoculated with these wild mushrooms they decompose rapidly while providing years of delicious mushrooms for the table. One large sycamore stump that I inoculated three years ago produces a steady supply of king oysters every year. Next time you’re at the market, look closely at the mushroom section and see if you recognize any of the over-priced, often wilting mushrooms on display. Perhaps you will see one resembling something you run over with your lawn mower every summer!